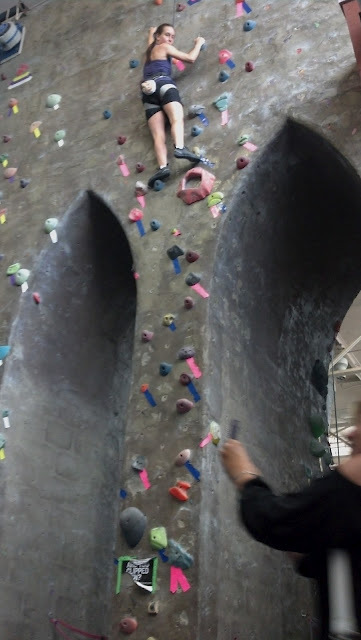 I purchased a Bloomspot deal to Brooklyn Boulders almost a year ago and finally cashed it in last weekend. The package included the Learn the Ropes class, 2 – one day passes with all of the gear and a drink (non alcoholic) for both Jayson and I. We had read all of the FAQ’s and were prepared for it all. We were the only “students” in our 11am class which of course I loved – one on one attention and going straight for the meat of the lesson. This guy was great, he played into the husband – wife thing and within minutes we were belaying away our fears from 12 – 15 feet above. Although, the FAQ’s recommended that you come alone, climbing encourages communication and a whole lot of trust and I recommend climbing with a significant other. Not too many “dates” can bring you together like fear and/or trust in the other persons rope. With our homemade kale, apple and beet juice waiting for us in the provided lockers, it is a great way to spend a rainy (or hot and muggy) day. I thought that I’d get bored quickly, but really there are so many different “climbs” to tackle on just one wall. And then there are the automatic belays and the walls that you can climb without ropes. Should you not want to climb, there is a ping pong table, yoga class (which you will for sure need after a day’s worth of climbing) and even a section to screw around on a tight rope and gymnastic rings. As always in NYC get there early or go during the week (I believe they are open until midnight). Happy Climbing! feel free to contact me for any other suggestions for fun dates. 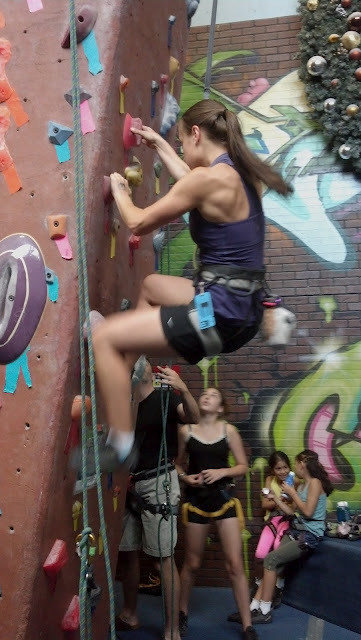 This entry was posted in summer fun, Uncategorized and tagged Brooklyn Boulders, indoor rock climbing. Bookmark the permalink.